Before they had finished their books, before Sharifa Rhodes-Pitts had published “Harlem Is Nowhere” — a finalist for the 2011 National Book Critics Circle Award — and before Emily Raboteau had published “Searching for Zion,” which was published in January, the two women used to take walks together. They would amble past the George Washington Bridge, the Morris-Jumel Mansion, Jumel Terrace Books and other landmarks in the Upper Manhattan neighborhoods where both authors currently live. Both Raboteau and Rhodes-Pitts are young mothers in their 30s whose nonfiction books share a common theme: a yearning for some sort of promised land. For Rhodes-Pitts, whose book is the first in a planned trilogy about black utopias, that place is Harlem; for Raboteau, it is not just one place, but a series of locations where displaced blacks have endeavored to find a homeland. A conversation with award-winning author Emily Raboteau. A Q&A and book (Searching for Zion) signing will follow. The event, “Race, Place and Community,” is free and open to the public. Light breakfast will be served. Those unable to attend can watch a live webcast of the event at bit.ly/EmilyRaboteau. Organized by the Duke Clinical Research Institute, the event co-sponsors include the Duke School of Medicine, the Office of Diversity and Inclusion, the Center on Arts, Digital Culture and Entrepreneurship, and Left of Black. 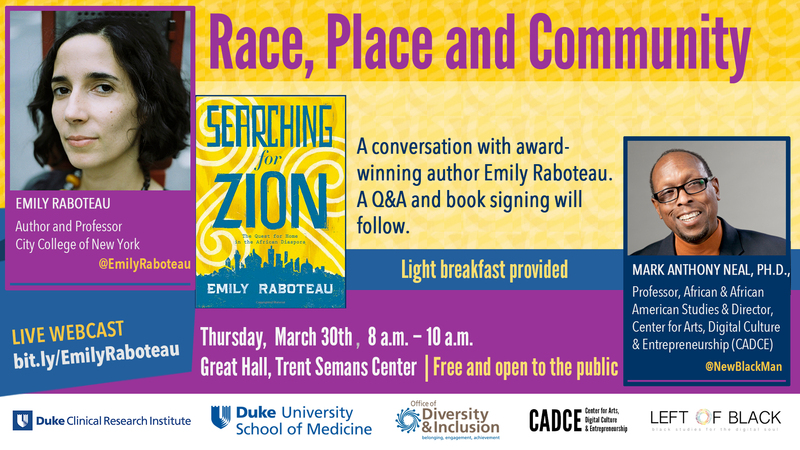 Award-winning author Emily Raboteau will visit Duke and Durham this week as part of the Duke School of Medicine’s ongoing series, A Conversation about Race. She will be interviewed by Mark Anthony Neal, a professor of black popular culture in the Department of African and African American studies. Neal, is also the co-director of the Duke Council on Race and Ethnicity and the host of the weekly webcast, Left of Black. A portion of the event will be recorded live for a future episode of Left of Black. The event, “Race, Place and Community,” is free and open to the public and will be held at 8 a.m., Thursday, March 30 in the Great Hall at Trent Semans Center. Light breakfast will be served. Those unable to attend can watch a live webcast of the event at bit.ly/EmilyRaboteau. Raboteau, an English professor at the City College of New York, will sign copies of her latest book, Searching for Zion, following the talk. The Fire This Time: A New Generation Speaks about Race is a collection of essays and poetry that takes its name from James Baldwin’s classic, The Fire Next Time. Jesmyn Ward, the collection’s editor and author of the National Book Award-winning novel, Salvage the Bones, was inspired to create the collection after finding solace in reading Baldwin in the wake of the seemingly never-ending killings of young black men covered by the media over the last few years. …Rumpus: Jesmyn has stated that she was very broad when she solicited pieces, explaining that she wanted to keep it open. Can you describe your experience receiving Jesmyn’s invitation to write something for this collection. Did you know right away what you wanted to write about or was it overwhelming? I feel what we’re what we’re experiencing with Trump and his constituents is a lot of backlash anxiety about the loss of white supremacy, but this too is part of progress. Mira Jacob and Emily Raboteau, “Our Kids, Their Fears, Our President?” Literary Hub, November 7, 2016. http://lithub.com/our-kids-their-fears-our-president/. Comments Off on I feel what we’re what we’re experiencing with Trump and his constituents is a lot of backlash anxiety about the loss of white supremacy, but this too is part of progress. Our Kids, Their Fears, Our President? Writers Mira Jacob and Emily Raboteau conducted this conversation via email during the week before the election, at night after getting their kids to bed. Emily Raboteau: Mira, Lit Hub has invited us to converse about the election and this historical moment as mothers, so I think jumping off from something about how our kids are handling the election (their fears, our fears, the way their fears mirror ours) and how we answer their tough questions might be a good entry point. I am a mother of two—G is five, and D is three. He will be a ninja for Halloween (a bad one, he insists, not a good one) and D will be a skeleton. G is interested in and seduced by bad guys, horror, the nature of evil, the power of evil embodied by Darth Vader, wolves in fairy tales, dark gods in myths, the power of natural disasters, tornadoes, hurricanes, gods attached to natural disasters, superhero villains, and the like, and so has an understanding of Trump as a real-life bad guy—a force to battle. He intuits that we are frightened of him, and so, is frightened of him. I think he considers the election a battle between good and evil. He asked me the other day whether it would be ok/appropriate for us to kill Trump if/when he shows up at our apartment door. I wonder if your son has asked you questions about Trump, Clinton, the election. And how you have fielded those questions? How old is he now? Mira Jacob: Wow. I read this and thought, ok, so we’re all just in it now. I hate to be relieved by that, but I am. Your son is that scared of a potential presidential candidate. Last month, my son Z, who just turned eight, said, “But Trump doesn’t like brown boys like me. If he’s president, does that mean the government won’t like me? The army? What about the police?” This, as he is falling asleep. Comments Off on Our Kids, Their Fears, Our President? An America in which the color of one’s skin no longer matters would be unprecedented. With the election of President Barack Obama in 2008, that future suddenly seemed possible. Obama’s rise reflects a nation of fluid populations and fortunes, a society in which a biracial individual could be embraced as a leader by all. Yet complicating this vision are shifting demographics, rapid redefinitions of race, and the instant invention of brands, trends, and identities that determine how we think about ourselves and the place of others. This collection of original essays confronts the premise, advanced by black intellectuals, that the Obama administration marked the start of a “post-racial” era in the United States. While the “transcendent” and post-racial black elite declare victory over America’s longstanding codes of racial exclusion and racist violence, their evidence relies largely on their own salaries and celebrity. These essays strike at the certainty of those who insist life, liberty, and the pursuit of happiness are now independent of skin color and race in America. 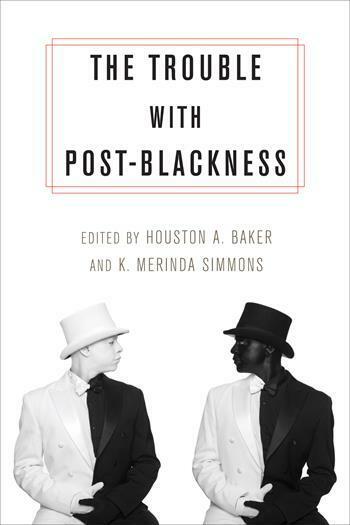 They argue, signify, and testify that “post-blackness” is a problematic mythology masquerading as fact—a dangerous new “race science” motivated by black transcendentalist individualism. Through rigorous analysis, these essays expose the idea of a post-racial nation as a pleasurable entitlement for a black elite, enabling them to reject the ethics and urgency of improving the well-being of the black majority. 10. Half as Good, by John L. Jackson Jr. Conclusion: Why the Lega Mask Has Many Mouths and Multiple Eyes, by Houston A. Baker Jr.
Do you ever dream of starting again in a new skin? This is the central question of Jess Row’s provocative and intriguing first novel, “Your Face in Mine.” It’s also a tag line of the shady enterprise in Bangkok where the book’s central character, Martin Wilkinson (né Lipkin), has paid a hefty sum to undergo something called racial reassignment surgery, to transform from a white Jewish man to an African-American one. We’ve seen variations on this premise before, in the 1986 comedy flop “Soul Man,” in which C. Thomas Howell takes self-tanning pills so he can attend ­Harvard Law School on a scholarship for African-Americans, and in the 1961 best seller “Black Like Me,” wherein the white journalist John Howard Griffin disguised himself as black to tour the segregated South by bus. Those stories advanced blackface tradition from minstrelsy to illustrate (as only a white man can — with a wink) that it’s harder in this country to be black than white. Thankfully, Row’s narrative delves into more nuanced territory. Marcia Alesan Dawkins, Clearly Invisible: Racial Passing and the Color of Cultural Identity, Waco: Baylor University Press, 2012, vxi + 229 pp. Michele Elam, The Souls of Mixed Folk: Race, Politics, and Aesthetics in the New Millennium, Palo Alto: Stanford University Press, 2011, xxiii + 277 pp. According to W.E.B. DuBois’s prophetic theory articulated in The Souls of Black Folk (1903), “the problem of the twentieth century is the problem of the color line” (221). Myriad critical and popular pieces over the past several years suggest that this theory has run its course: the celebration of mixed race people putatively implies the “end” of race. Certainly the election of the first biracial president has been touted as the epitome of post-race life in America. Yet as recent critical interventions by Michele Elam and Marcia Alesan Dawkins remind us, race remains prevalent because of biracial people, not in spite of it. The continuities between DuBois’s theory and Elam’s are underscored by the title of the latter’s monograph. In The Souls of Mixed Folk, the Stanford University English Professor asserts that the notion of post-Black art being apolitical is a complete fiction, much like the idea that post-Civil Rights politics are in decline. By examining the images of mixed race subjects in a wide range of artistic forms, Elam argues that these venues are the newer locations that “engage issues of civil rights and social change” (16). To accept this belief, she begins her book by convincing readers that the increased interest in mixed race deludes many people into believing that race no longer exists. If this is truly the case, then why do fictional representations of biracial people continue to represent anxiety across a multitude of genres? More specifically, why has the last several years seen a resurgence in narratives of racial passing—such as Philip Roth’s The Human Stain? Elam explores these questions across five thoroughly researched and well-written chapters. The first traces the history of mixed race studies in curricula across the nation while raising related yet ignored issues. For instance she problematizes the focus of heteronormative depictions of mixed race families at the expense of homosexual ones, while also reminding us that mixed Americans have historically been the result of sexual violation. She believes we must be mindful of considering the product of these unions as representatives of racial progress without understanding the nuances of slavery and violence inflicted on black bodies by whites. Chapter two changes the focus from history to contemporary comic strips by Aaron McGruder and Nate Creekmore. In their works, Elam rightly sees racial identity as “a matter of public negotiation, social location, cultural affirmation, political commitment, and historical homage” (58). In chapter four, Elam situates the traditional European bildungsroman against the “mixed race bildungsroman”. The former focuses on the “social incorporation of the individual” (125) whereas protagonists in the latter are not “incorporated into the society or the social progress that they are supposed to represent . . . [and they] challenge the popular image of the ‘modern minority’” (126). 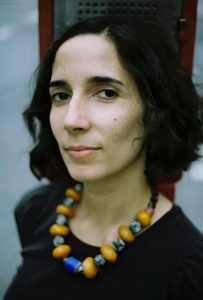 She applies her theory of the “mixed race bildungsroman” to Emily Raboteau’s The Professor’s Daughter (1997) and Danzy Senna’s Symptomatic (2004). Elam’s last chapter examines performances of mixed race in Carl Hancock Rux’s play Talk and “The Racial Draft” skit from Dave Chappelle’s defunct late-night comedy show. Her argument here is that in both performances, there is a “re-visioning and a re-membering of the national order” (161). The middle chapter is the one that is most germane to this journal, as it examines racial passing in Danzy Senna’s Causcasia (1999), Philip Roth’s The Human Stain (2000), and Colson Whitehead’s The Intuitionist (2000). Despite research to the contrary, Elam begins this chapter by arguing that racial passing literature is far from being an obsolete genre, as these novels attest. Despite living in a post-race era, these narratives collectively argue for the rebirth of racial passing as a “social inquiry” (98). Explaining further, the novels addressed here force readers to reconsider “the performative, iterative nature of racial identity as a rich social heuristic” (98).